A carriage hook plate is bolted to the centre of the fork truck carriage. This can stay on permanently as it does not interfere with the normal lifting and moving of pallets and is only 300mm wide. When the forks are inserted fully into the fork pockets and raised, a sprung loaded lever locks behind the carriage hook plate and will only release when the unit is lowered to the ground. This reverses the action and the forks can be withdrawn from the unit. 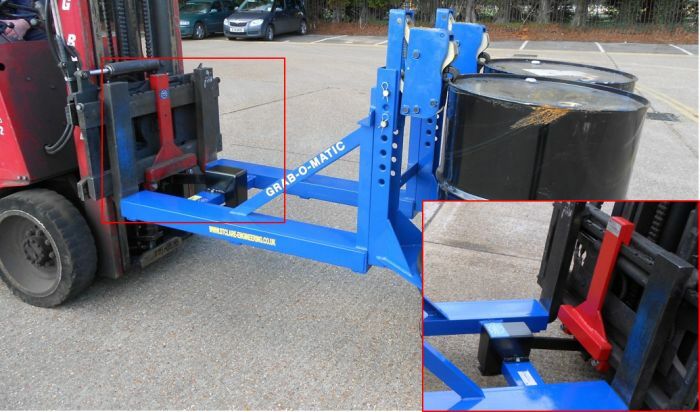 The Grab-O-Matic Quick Attach and Release System was developed to save time and increase safety when securing mechanical fork attachments to a fork truck. The greatest savings are made if the truck driver is constantly changing fork attachments or moving from pallets back to drum grabs several times a day. The return on the initial investment is very quick due to the significant time savings realised and the corresponding safety benefits. Traditional methods involve the truck driver dismounting from his cab to tighten the T bolts or secure the chains each time the fork attachment is to be changed. However, because this involves extra work and is time consuming, drivers will often neglect to do this resulting in a safety risk. If the fork truck needs to brake suddenly, the load will fly off the front of the forks with the potential risk of the drum(s) splitting and causing an expensive clean-up operation. In the worst case scenario someone can get seriously hurt. With the Grab-O-Matic Quick Attach and Release System the attachment is always secured to the fork truck. To secure the fork attachment, just drive into the fork pockets, raise the carriage and the unit is automatically secured. To release just stop, lower and reverse and the lever automatically disengages from the fork truck. Eliminates the need for the fork truck driver to dismount from his cab to secure the drum grabs to the forks with traditional methods such as T bolts or chains. Saves valuable time when switching attachments. Safer as the Quick Attach and Release System reduces the risk of accidents as the attachments are always secured to the fork truck. Compatible with all types of fork truck carriage including side shifts. The quickest, simplest and safest way to secure attachments to the fork truck. Stainless Steel and ATEX units also available. The Quick Attach and Release Drum Handling frames are universal with all current Grab-O-Matic pillars and gripping heads and is a safe, secure and efficient way to attach the Grab-O-Matics to any fork truck. It is available for most of the Grab-O-Matic range of fork truck attachments, Drum Rotators, Waist Gripper Drum Handlers, Snow Ploughs, Base Grippers and Drum Cages and can be incorporated on many bespoke items if required. Stainless Steel or ATEX units can also be supplied with a Quick Attach and Release System. 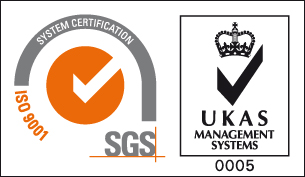 The system has been extensively proven in the field over a number of years with in excess of 100 units currently in use, all with positive feedback from the end users due to the ease of use, cost savings in time and increased safety. If you are looking for a cost-effective way to save time, increase productivity and safety, please contact us to discuss your options for a new Drum Handler or Fork Truck Attachment fitted with the unique Quick Attach and Release Drum Handling System.